Almost everyone belonging to the world of commerce, and who consider themselves a consumer to some degree, certainly make use of various denominations of paper currency or banknotes just about every day of their lives without giving them but a passing thought. However, out of sheer curiosity, the number of times one might take a really good look at the legal tender housed in their wallet or purse is more than likely somewhere close to never. For any paper currency collector, on the other hand, periodically examining the contents of their wallet very closely, using a magnifying glass or a jeweler’s loupe, is just part of their fascination for an extremely captivating hobby. Over an extended period of time, their interest in collecting paper currency has grown simply because of viewing the abundance of information any example of paper currency or banknote provides. Because of this wealth of both historical data and artistic splendor revealed by this careful scrutiny, scores of people from all over the globe have become interested in collecting paper currency or banknotes. From a cultural standpoint, collecting paper currency and banknotes from different countries allows anyone to travel all over the globe without having to leave the comforts of their home. Collecting paper currency, just like coins, allows anyone to explore the many different cultures, countries, and continents, along with becoming familiar with the people, nature, geography, and social influences that play a significant role in the various civilizations of our world. In addition, collecting paper currency teaches the collector about the arts, the history, the foreign languages, and even about the politics and government represented by each country’s particular currency. Once the paper currency or banknote collection begins to grow and diversify, each collector can begin to consider themselves an investor in the world’s marketplace, which in turn helps these economies and cultures to prosper. Banknote and paper currency collecting is a truly exciting and educational hobby enjoyed by thousands of people all over the world, and as every collector knows, their collection requires not only having the very best methods to display or present it, but also ensuring that it is stored and preserved using the most stable and secure currency storage tools available on the market. There are numerous storage solutions available, from a wide variety of currency pages, pocket pages, acrylic currency holders, currency sleeves in archival safe polyester or crystal clear vinyl, currency boxes and currency cases, to currency albums and wallets from Dansco or Whitman. Safgard Currency Sleeves are inert and archival-safe, and are perfectly suitable for long-term storage requirements for all bank notes and paper currency. 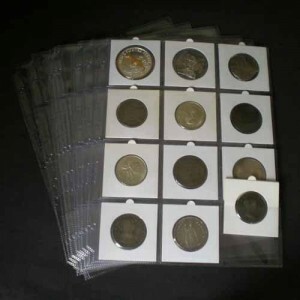 They are manufactured by the industry leader in coin collecting storage supplies – the makers of KOINTAINS and SAFLIPS, and are used by some of the largest museums and paper currency dealers. Safgard Currency Sleeves are available in three sizes, Fractional 5 1/4″ x 3″, Modern 6 5/8″ x 3″, and Large 8″ x 3 1/2″. Damage to any form of paper currency is all too easy through tearing, moisture, oils, acids and salts from skin contact, or even temperature extremes. Currency pages provide a good level of protection against many of these hazards. This is extremely important when friends or fellow collectors might like to enjoy viewing your currency collection without using their bare hands, while keeping them in a perfectly organized and protected currency binder. Currency pages are one of the best methods for storage and protection for paper currency, safeguarding against the effects of dirt, dust, and moisture. Currency pages are available in either vinyl or vinyl-free components, sized based on pockets per page, and can be utilized as strand-alone sheets or in sturdy 3-ring binders. These durable, crystal-clear polished vinyl pages are designed with electronically sealed edges, which provide visibility on both sides for the best viewing. The 3 pockets per page for large currency, and the 4 pockets per page style is for modern or small currency. Both page styles fit standard 8 ½” x 11″ 3-Ring binder notebooks. These SuperSafe pages are made from archival-safe, vinyl-free 100% Protar polyester material that provides an acid, oil and PVC-free storage environment for paper currency. For large currency notes, currency pages with fewer pockets per page are more suitable. SuperSafe also manufactures museum-grade currency sleeves made from 4 mil polyester, and are perfect for long-term storage needs. They have a fold-over design which leaves both ends open and allows for easier insertion of paper currency or banknotes. SuperSafe Pocket Pages fit 3-ring binders and are available in 1, 2, 3, or 4 pocket styles. Collector Safe Currency Cases are a two piece acrylic, slab-style case designed to hold paper currency and banknotes, and features a snap-together design with crystal-clear views for both sides of the currency. Unlike pocket pages, a currency case prevents the banknote from bending or folding. These holders are archival quality, and are a superior choice for long-term currency or banknote storage, and are available for both modern and large currency. Capital Plastics Currency Cases come in two sizes, Model CH2 is 7.5″ X 4.5″ for modern currency, and Model CH1 is 5″ X 9″ for large currency. Capital Plastics Currency Cases are crystal clear ‘screw-down’ style currency and banknote holders, providing perfect visibility for both-sides viewing and long-term storage protection capability. Currency Storage Boxes are the perfect solution for storing currency sleeves. They are available for both modern size and large size sleeves. The modern currency box holds up to 125 modern currency sleeves and measures 7 3/8″ x 4 1/4″ x 3 1/4″. The large currency box holds up to 125 large currency sleeves and measures 8 1/2″ x 4 1/4″ x 3 3/4″. They are strong, sturdy, and stackable. Currency albums and wallets are a superb method for organizing any currency collection, while providing a convenient technique for presentations or display purposes. The albums or wallets open flat, and are available from leading manufacturers like Dansco, Whitman, and SuperSafe. Currency albums are perfect for storing a currency collection inside a safe or on a bookshelf, while the currency wallet allows for convenient portability for small quantities of paper currency. The Dansco Currency Album comes with eight 3-pocket style pages for modern currency, and is presented in a rich, brown leatherette cover. Each currency sample displays and fits neatly into its own pocket, and reveals both the obverse and reverse sides through clear acetate pages. The album features distinctive gold-tone lettering, is fully expandable, and made from archival-safe materials. SuperSafe Graded Currency Albums are 3-ring, padded vinyl binders measuring 11 3/4″ x 12 1/4″ x 2 1/4″, and includes twenty 2-pocket style pages manufactured in archival-safe polyester and PVC-free materials. The pockets are sized to contain graded currency or banknotes from PCGS, PMG, and other grading services. The pocket dimensions are 9 1/2″ by 5 1/2″. Whitman Currency Albums feature a black leatherette binding containing 12 pages, and will hold 36 modern or large-sized currencies. Its durable construction uses metal-reinforced corners and an attractive gold foil-stamped front cover. All currency contained inside will be visible from both sides when using individual currency sleeves. The album measures 10 7/8″ x 13″ x 1 3/4″. Whitman Currency Wallet features clear, inert-plastic pages offering both-sides visibility with great protection for paper currency and banknotes in a conveniently portable size. It features a blue vinyl cover and back containing ten top-bound currency sleeves, and is available in both large currency and modern or small currency sizes. ← Why Wear Finger Cots When Handling Coins?